Filmfood: "Il Ragù di Sofia Loren"
"Il Ragù di Sofia Loren"
Sophia Loren as a masterful cook and mother. Set in a village near Naples (Pozzuoli, were Loren grew up): an Italian family ritual of Sunday dinner where everyone awaits the traditional 'ragù' sauce. 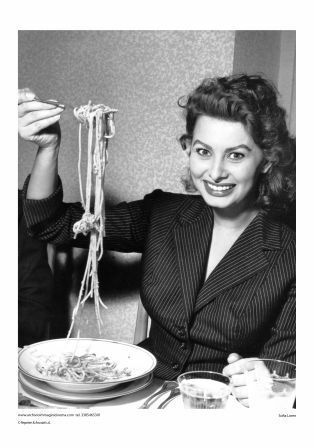 Sophia Loren famous quote: "Everything you see I owe to spaghetti"
Italian Chefs began a campaign to defend the reputation of one of its most famous but most widely abused exports: pasta with bolognese sauce. The traditional 1982-registered recipe for Italian 'Ragu' demands only beef, pancetta, onions, carrots, celery, tomato paste, meat stock, red wine and milk.